A few weeks ago a star-struck Paul Warne asked Pep Guardiola for a picture after they were at an awards dinner together. Now, in a few weeks' time Warne will get to pit his wits against the Spaniard from the opposition dugout after Rotherham were handed a Red Letter Day in the FA Cup by being drawn against Manchester City. Ali Benarbia then won it for City at the death with a deflected effort as Ronnie Moore's men were robbed. The Millers will head to the Etihad Stadium for a plum third-round tie over the weekend of January 5-6. Guardiola, who has turned City into the best team in the land, might not have heard of Warne prior to their meeting in Manchester last month, but he will know about him by the time the two teams meet after Christmas. It will be Rotherham's first visit to City since a Division One meeting in 2001 when Warne and goalkeeping coach were involved in the side that were on the end of a huge injustice. The Millers went toe-to-toe with Kevin Keegan's City, who were runaway leaders of the division, and led through Chris Swailes' header. However, they were pegged back in controversial circumstances on the stroke of half-time as Christian Negouai did his best impression of Diego Maradona and flicked the ball home with his outstretched hand. Warne will be hoping to travel across the Pennines with his Millers squad still in tact, with the transfer window having opened a few days before. 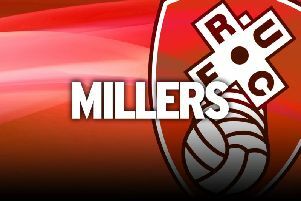 The Millers boss has said a good window would represent all his key players still being at the club at the end of it. And Warne is lining up potential recruits in case he does lose some players. He said: “We're getting our options in place in the areas where we feel we might have to strengthen whether that's because we lose a player to a ridiculous bid or because someone is dejected and wants to leave to play more first-team football. We're prepared for both scenarios.